Leland D. Melvin, former astronaut and NASA associate administrator for education. 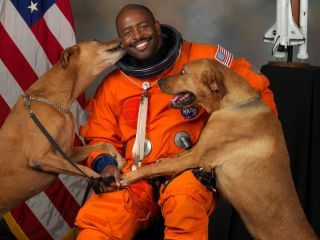 Leland Melvin, the NFL football player turned NASA astronaut, now spends his days inspiring women and minorities to pursue careers in STEAM fields (science, technology, engineering, art and math). Today the storytelling platform Makers, which features trailblazing women of the world, is celebrating Melvin's work on gender equality by adding him to a new, select group called Makers Men. The retired shuttle astronaut swept the Internet off its feet when he famously snuck his two adorable dogs, Jake and Scout, into NASA for his official portrait in 2009. But that's just one of the many reasons why Melvin is unique among NASA astronauts. He's also the first (retired) NFL player to blast off into space. And of the 321 astronauts NASA has ever selected, only 16 have been African-American, including Melvin. After a hamstring injury ended his professional football career, Melvin never dreamed that a new career would take him into outer space. As an African-American athlete from a small town, at a time when NASA's astronaut corps was almost completely white, being an astronaut didn't even cross his mind as a career option. "Chasing Space: An Astronaut's Story of Grit, Grace, and Second Chances" by Leland Melvin. But now that the universe has shown him that it's possible to overcome societal barriers and do great things, Melvin aims to show others who think they can't be astronauts that anything is possible, no matter their gender or ethnicity. "I grew up in a small Southern town in Virginia, and I've always seen that women and minorities, lots of times, have been kind of … not thought of," Leland told Space.com, "kind of like the hidden figures like Katherine Johnson." He said he felt that people in the community were often being marginalized. "How we support them can really lay the foundation of helping others get through tough situations, or helping them find their way, or their why, and how they're going to strive to be successful. So I've always been kind of a champion of the underdog, and a lot of times that's been women and minorities, especially in technical fields." Melvin said that he hadn't ever considered working for NASA until a woman named Rosa Webster grabbed his arm at a career fair in Virginia. Webster told him, "I'm going to personally make sure that you know everything you need to know about NASA so you can, you know, be part of this NASA team," Melvin recalled. At the time, NASA was making an effort to diversify its astronaut corps, so Melvin was apparently in the right place at the right time. In astronaut training, Melvin experienced another injury that put his career on the line. While doing underwater EVA training, he lost his hearing and became medically disqualified to go to space. He started working at NASA's Education office, and his hearing eventually returned. After checking on Melvin's ears during a series of airplane flights to memorial services following the loss of the Space Shuttle Columbia in 2003, one of NASA's flight surgeons deemed him fit to fly, and signed a waiver that served as Melvin's ticket to space. In February 2008, Melvin finally launched into space for the first time aboard STS-122. He returned to space in November 2009 with STS-129. Both missions launched on the space shuttle Atlantis and worked on the construction of the International Space Station. NASA's record-breaking astronaut Peggy Whitson, who now commands the International Space Station, served as a major inspiration to Melvin on his first shuttle mission. In October 2007, just a few months before Melvin first went into space, Whitson became the first woman to command the space station. After STS-122 docked at the space station in February 2008, Melvin recalls Whitson inviting everyone to dinner in the Russian segment of the space station. "So we're having this moment where we're breaking bread with people you can fight against — like the Russians and the Germans — and we're having this meal going around the planet every 90 minutes at 7,500 miles per hour, and a civilian woman is in charge of everything. Large and in charge. It was so beautiful to have history being made with Peggy." Now retired and earthbound, Melvin was named the NASA associate administrator for education in October 2010. He also served as the co-chair on the White House's federal STEM Education Task Force. With do-it-yourself experiments in the back of the book and 16 pages of striking full-color photographs, the Young Readers Edition of "Chasing Space" by Leland Melvin is the perfect book for young readers looking to be inspired. Today, Melvin released his new autobiography, "Chasing Space: An Astronaut's Story of Grit, Grace, and Second Chances," along with a young readers' edition of the book. "'Chasing Space' is the story of a kid from a small town never imagining the possibilities of going to space or doing these incredible things, but was a kid who overcame many obstacles," Melvin said. Makers Men first launched at the 2017 Makers Conference, and "highlights a select group of men who have taken concrete actions to help make the world a more equal place for women," a spokesperson for Makers said in a statement. Melvin is one of the first men to join the Makers Men, along with Seattle Seahawks quarterback Russell Wilson and singer-songwriter John Legend, who have also fought for underrepresented people.